1. Remove master cylinder reservoir cap. 2. Remove tires from vehicle using power tool. 4. Remove connecting bolt and torque member bolts using power tool, and remove cylinder body. Make sure parking brake lever is completely disengaged. Hold down the disc rotor with the wheel nut and remove the adjuster hole plug. Insert a flat-bladed screwdriver through the plug opening and rotate the star wheel on the adjuster assembly in the direction shown to loosen and retract the brake shoes. Prior to removing disc rotor, make alignment mark using a marker between the hub and disc rotor. Remove wheel nut and rotor. Refill with new brake fluid. Never reuse drained brake fluid. Align marks made during removal on the hub and disc rotor. 2. Install cylinder body to the vehicle, and tighten torque member bolts to the specified torque. CAUTION:Before installing cylinder body to the vehicle, wipe off oil and grease on washer seats on axle assembly and mounting surface of cylinder body. 3. Install brake hose to cylinder body and tighten connecting bolt to the specified torque. Do not reuse the copper washer for connecting bolts. 4. Add new brake fluid and bleed air. 5. Install master cylinder reservoir cap. 6. Adjust the parking brake. 7. Attach the tires to the vehicle. low mileage. Refer to "
Sorry for missing out on the diagrams. 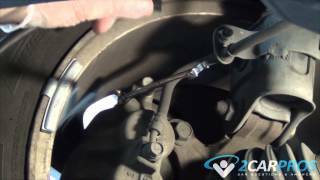 Step by step instructions on how to replace automotive rear brake pads and rotors. This article pertains to all rear disc brake vehicles. 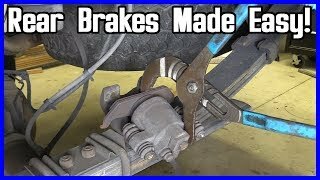 1996 Nissan Altima Brake Pedal Acting Up.